Arrhythmias, or irregularities in the heart's rhythm, may develop over time in patients with congenital heart disease. These may be caused by conduction difficulties resulting from surgical incisions or the scarring of heart tissue after repair operations, or by other factors, such as the enlargement of heart chambers. 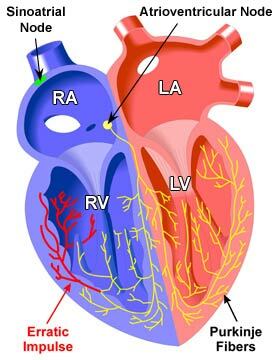 When heart tissue is modified or relocated during the repair of structural abnormalities, the conduction pathways that carry nerve impulses within that tissue are often displaced. This may lead to irregular or erratic patterns of muscular contraction in the heart. > Atrial fibrillation - the rapid and erratic contraction of muscle fibers in the atria, or upper chambers of the heart. This results in a rapid and irregular pulse. > Atrial flutter - rapid and erratic contraction of muscle fibers in the atria that is less severe than in atrial fibrillation. > Heart block - a condition in which the impulses from the heart's natural pacemaker (sinoatrial node) are delayed (1st degree heart block), partially blocked (2nd degree), or completely blocked (3rd degree) as they make their way to the pumping chambers (the ventricles). > Sinoatrial node dysfunction - The sinoatrial (or sinus) node is a small mass of specialized heart muscle fibers near the top of the right atrium that acts as the heart's natural pacemaker. If the impulses from the sinoatrial node are irregular or too fast or too slow, then the heart's rhythm will be abnormal. > Ventricular tachycardia - an abnormally fast rate of contraction of the ventricles, or pumping chambers of the heart.